Note the differences in lettering at each corner of the diamond shaped labels. The taller label includes the letters W & Co. with a G (standing for Galt) at the bottom. It is presumed that the W & Co. specifically stands for WARNOCK & COMPANY. The smaller diamond includes the letters J W & CO. with a G at the bottom. Although in different relative positions, the initials stand for JAMES WARNOCK & CO.
Paper labels used by Warnock & Co. and possibly used in the early years after Allan Hill took over the business. James Warnock was born in Nelson, Scotland, a suburb of Glasgow, in 1825. In 1833 he immigrated to Canada along with his parents and at least one sibling, his younger brother, Adam. Two years after originally settling in Beverly, the family moved to Galt, (now Cambridge) Ontario, where James and Adam received some formal education. In 1850, Adam went into partnership in a grocery business with a man named Fraser. That partnership lasted until at least 1857 and possibly longer. The significance of the year 1857 is that it marked the beginning of a partnership between James and Adam in what was originally called Warnock & Company. 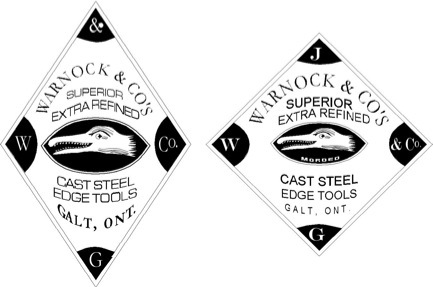 Details are vague, but it may be that Warnock & Company was actually established for the purpose of being the proprietors of the Galt Edge Tool Co., also called the the Galt Axe Co. and the Galt Axe Factory. In 1860 James bought a hardware store where he sold the products of various manufacturers. One of those manufacturers was Date’s Patent Steel Co. Date was connected with the original founder of the Galt Axe Factory as well as two other manufactories that dealt in metal products. 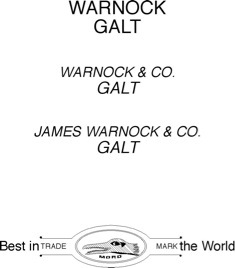 (See additional information under Galt Edge Tool Co.) It is strongly suspected that there was an interaction between James' activities in the hardware business and Warnock & Co. but the specifics of such a connection are not known. The duration of James's involvement in the hardware store business is unknown but in 1870 he formally took over the Galt Axe Factory, renaming the factory and the supplemental structures and surroundings, the Galt Edge Tool and Carriage Spring Works. The name of the company was legally James Warnock & Company. The disparity in names seems to have caused some confusion but it did permit the company to function as a more complex or diversified enterprise. Many of the axes marketed at that time were marked J. Warnock & Co. By 1902, possibly earlier,James Warnock & Co. were offering a line of tools for lumbermen. In 1909 the Galt Axe Factory was sold to Allan Hills. Interestingly, the Galt Axe & Carriage works was on Water Street where Adam Warnock, together with seven other businessmen, collectively known as "The Syndicate", purchased and converted a textile mill into a what became known as the Galt Knitting Company. Adam was the president, a position he held for twenty years, which suggests he personally was not very active in the edge tool manufacturing operations unless is was on the business side of the company. Simple lettered stampings used on different axes. Stamping with logo used on some axes. Cross reference other articles published on the YesteryearsTools web site that relate to this article WARNOCK CO.
Facsimile of advertisement that appeared in the November 1902 issue of Canada Lumberman. 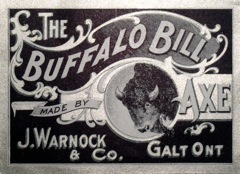 Photograph of a paper label used by Warnock & Co.